Fire-roasted jalapeños have a complex, smoky taste that enhances salsa and other dishes with a richer flavor than raw jalapeños. Grilling jalapeño peppers instead of frying them is also a healthier, more piquant way to prepare a classic appetizer. A little preparation goes a long way when cooking with jalapeños. Adjust the spiciness of the peppers by trimming them. 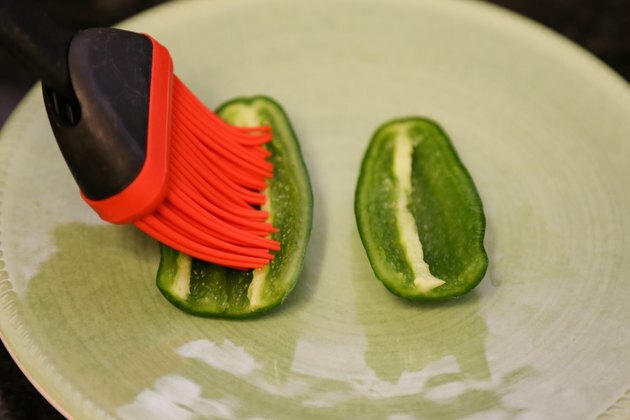 Create a nonstick surface on the hot grill grate, or use a clever tool that suspends jalapeños above grill. 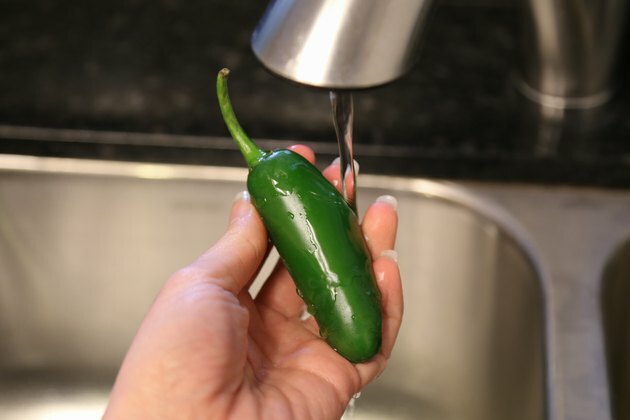 Rinse the jalapeños in cool, running water and pat them dry. Slice the tops off the peppers just below the base of the stem with a paring knife, creating an opening in the top of the jalapeños. Slice them in half lengthwise, if desired. Remove the seeds and the light green spine -- the placenta -- that runs down the middle of each pepper to reduce the intensity of the jalapeños’ heat. 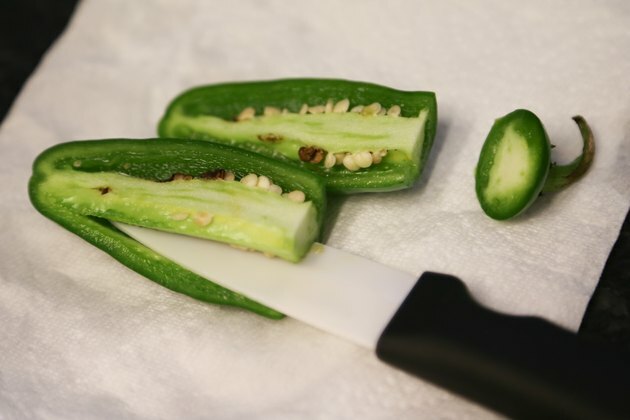 Use a paring knife to slice or scrape out the spine, which is the hottest part of the pepper because the capsaicin glands are concentrated there. Brush the peppers with olive oil and salt them to taste. Stuff the jalapeños with a filling, such as cheese or salsa, if desired. Or wrap stuffed jalapeños with pieces of bacon. Secure the bacon to the peppers with toothpicks to prevent the bacon from falling off on the grill. Spray the rack of the preheated grill with cooking spray to prevent the jalapeños from sticking to the metal and tearing. 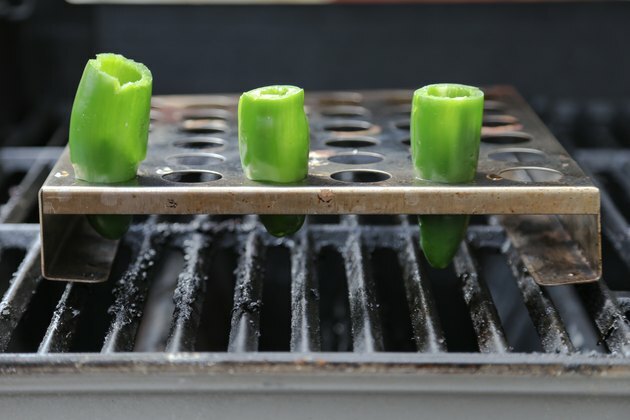 Or insert the peppers into a jalapeño grill rack -- an elevated metal tray with quarter-sized holes in the top. The rack holds jalapeños just above the grill grate, allowing the peppers to roast slowly and cook longer than they would if you placed them directly on the grate. 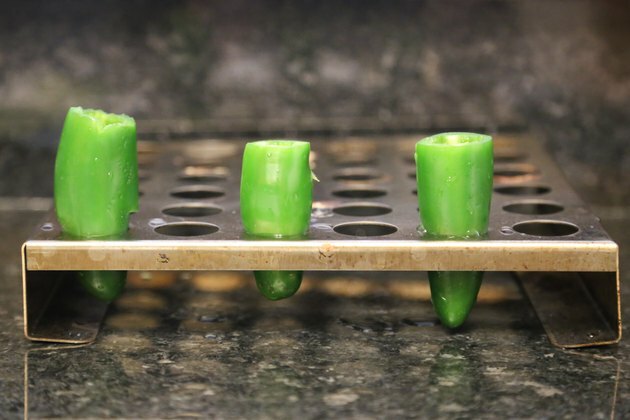 Keep the peppers whole to fit into a jalapeño grill rack properly. Place the peppers or the jalapeño grill rack on the grill. Roast them until the skin has charred. Grill them directly on the grate cook for five to 10 minutes; peppers grilled in a jalapeño grill rack cook longer, as long as 30 minutes. Check the jalapeños frequently, and turn them with tongs, as needed to char the skins of the peppers evenly. 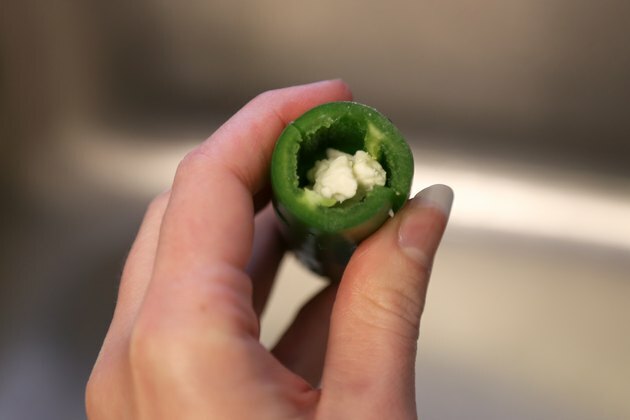 To remove the placenta and seeds of an untrimmed jalapeño or stuff the pepper with filling, slice the jalapeño vertically from the tip of the pepper to the top, stopping just below the base of the stem. Soak the peppers in salt water for an hour to further diminish their heat. Moist, dense fillings that naturally bind or clump together, such as cream cheese, are the easiest fillings to work with. 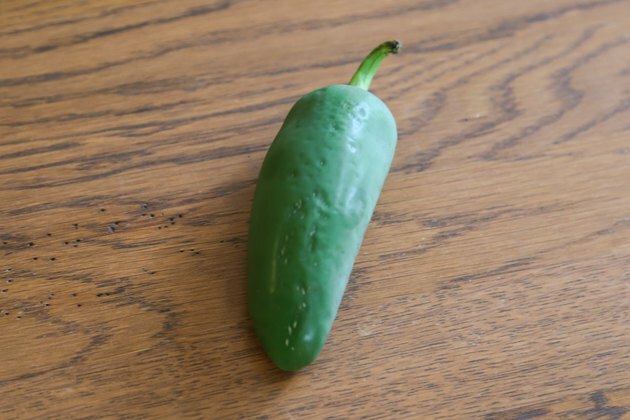 If you want to remove the skin from unstuffed jalapeños after grilling them, place the peppers in a brown paper bag or covered container after taking them off the grill. Remove the peppers from the container after 15 minutes, and scrape off the charred skins. Avoid touching your face, particularly near your eyes or nose, when you are working with peppers to avoid transmitting capsaicin, which will burn delicate skin or membranes. Wear thin rubber gloves while handling raw peppers if you have sensitive skin. What Color Pepper Is the Healthiest?